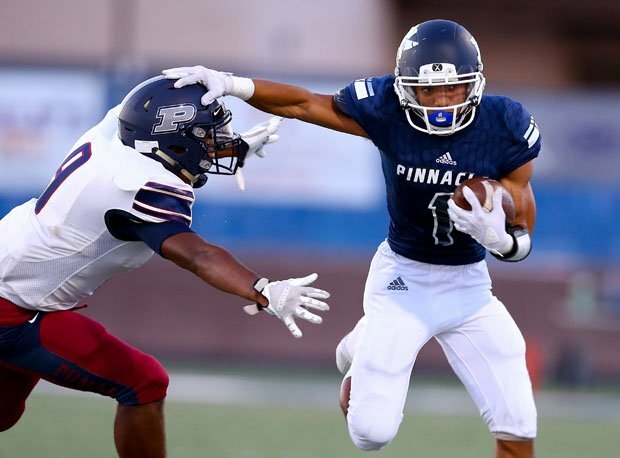 Heading to National Signing Day, we present 100 of the most overlooked and under-recruited football players of 2019. What do these NFL standouts all have in common: Aaron Rodgers, Antonio Brown, Carson Wentz, Adam Thielen, Chris Hogan and Cooper Kupp? All were afterthoughts following their senior seasons in high school. All lacked recruiting stars or offers. 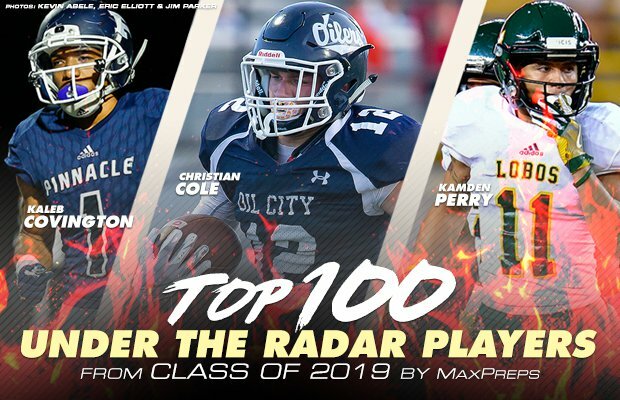 With National Signing Day exactly three weeks away, we present our MaxPreps Top 100 Under the Radar list for 2019 graduates. Note that of Tuesday, 56 of the 100 selected are completely unrated by 247Sports and 50 don't possess a single offer at any level. Only players whose data was submitted to MaxPreps were considered for the list. Players with offers from a Power Five conference school were not considered for inclusion. On-the-field production, performance and promise were the most important criteria to make the Top 100. Good grades and character were also pluses. Check back here in future years to see if 2019 selections were discovered and delivered in the fashion of Rodgers, Brown and the bunch. The pro-style threat was 10th among all seniors nationally in passing yards with 4,366. He also averaged 335 passing yards per game and tossed 38 TDs. A dynamic, dual-threat standout with tremendous feet and quickness, Baker had rushing games of 275, 261, 209 and 405 among his first five games in 2018. Bevel broke two state records in one game throwing for 789 yards and 12 TDs. Threw for 4,521 passing yards with 59 TDs this season. The first team All-State selection rushed for 2,815 yards and 38 TDs while averaging 10.4 yards per carry — as a quarterback. He also notched 1,332 passing yards and 18 TDs. The sure-fire gunslinger was 26th among all seniors nationally in passing yards with 3,744 and threw for 43 TDs. An electrifying playmaker, he piloted Shadow Creek to the Class 5A D1 state title game — in the school's first season playing varsity football. He also recorded a state record 99-yard TD run in that contest and compiled 3,418 total yards and 44 TDs on the season. Racked up 963 rushing yards and 49 TDs this season. He was 31st among all seniors nationally with 3,646 passing yards and had 6,453 for his career. The nation's 80th-rated pro-style QB earned All-State honorable mention after totaling 2,734 passing yards with 29 TDs in Georgia's highest classification. Coach Josh Hooten said colleges should be knocking down the door on the dual-threat star. Matocha has run 4.6 in the 40-yard dash, high jumped 6-feet, 9-inches and thrown for 3,700 yards and 35 touchdowns. He added 804 yards rushing and 14 TDs in 2018. "He's a freak athlete," Hooten said. "I think he is a kid that people will be talking about in a few years as a 'where did this kid come from' list." A second team All-State selection, he guided undefeated Greenwich to a Class LL state championship in Connecticut's highest classification and notched 2,474 passing yards with 39 total TDs. Set the Oregon state passing record with 59 touchdown passes and tossed only six interception. He threw for 3,892 yards for the 12-1 Wildcats. With a 4.2 GPA and a 4.7 40-time, Wilsonville coach Adam Guenther said: "Nathan is a great kid and player. He's absolutely slipping through the cracks. Someone is going to get a steal." Had the 10th-most passing yards (4,424) and 12th-most total yards (4,686) among all seniors nationally in spearheading San Gorgonio to the Class 5-AA state championship game. Totaled 2,930 passing yards and 35 TDs in one of the toughest classifications in America. He also possesses prototypical size and arm strength. 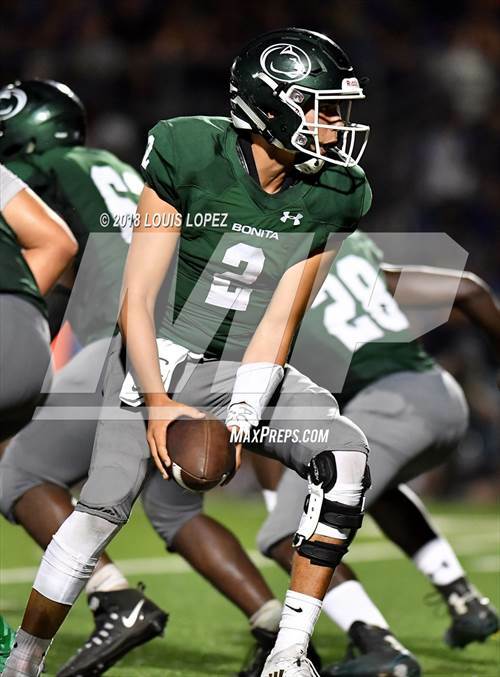 The second-team All-State selection threw for 2,249 passing yards with 24 TDs in leading Highland to the Class 5A state championship in Idaho's highest classification. 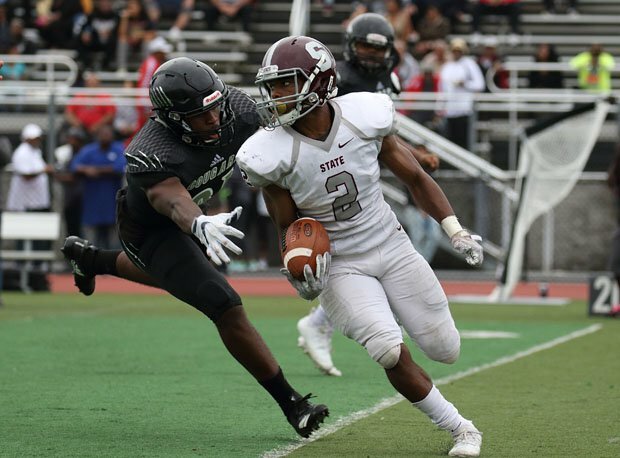 The first team All-State running back did it all, logging 2,053 rushing yards and 28 TDs, including the game-winning score in the Class A state championship. The three-time state high school wrestling champ also registered 55 tackles and six pass deflections on defense. 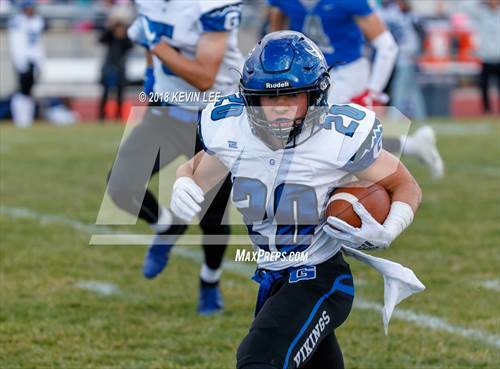 Churned out 2,021 rushing yards and averaged 8.2 yards per carry with 26 total touchdowns in earning second team All-State honors. A first team All-State selection who logged 1,334 rushing yards, 609 receiving yards and 29 total TDs. 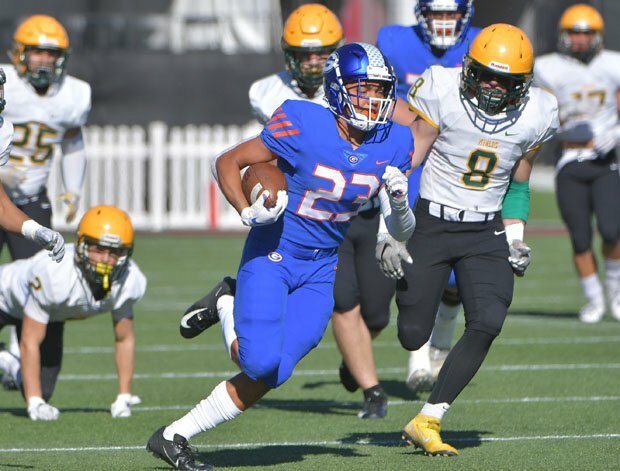 Proved his worth by rushing for a state record six TDs in the Nevada championship to give Bishop Gorman its 10th consecutive Silver State crown. The clutch performer racked up 1,439 rushing yards and 24 total TDs in nabbing second team All-State honors. A rushing threat — 1,014 yards, 15 touchdowns — and a lockdown cornerback (60 tackles), Council led the Cougars to an 11-3 season. The first team All-State selection dominated on both sides of the ball, reeling off 1,736 total yards and 21 TDs on offense. The ball hawk safety also recorded 84 tackles, seven tackles for loss and two forced fumbles. Generated 2,102 rushing yards and 24 total TDs in claiming first team All-State honors. Second team All-State recipient produced 1,555 rushing yards and 20 TDs while averaging 8.5 yards per carry. Put up 2,637 rushing yards and averaged 189 rushing yards per game with 37 TDs in spurring Joliet Catholic to a Class 5A state crown. Also snagged first team All-State honors. The top running threat the last two seasons for the two-time state champion Monarchs, Harper rushed for nearly 3,000 yards and 49 touchdowns over three seasons with 59 career catches and six more scores. Strong, shifty and fast. Dynamic playmaker compiled the 13th-most rushing yards among all seniors nationally (2,872) with 45 TDs in leading Liberty Hill to the Texas 4A D1 state title game. Averaged 240 rushing yards per game and led all seniors nationally in rushing yards with 3,839. He also attained the fourth-most TDs among all seniors (57) in boosting Kaiser to the Class 3-A state title game. 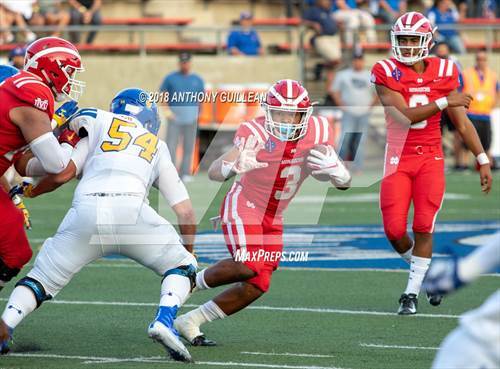 Registered 778 rushing yards and 14 TDs for the 14th-ranked Huskies playing against some of the best competition in Southern California. Manufactured the 17th-most rushing yards among all seniors nationally (2,801) and averaged 14 yards per carry with 32 TDs. Scored more touchdowns than any senior in America (63) and averaged 15 yards per carry and 294 rushing yards per contest. The durable playmaker logged 1,924 total yards and 19 TDs in helping Union capture the Class 4A state championship. He also recorded 31 tackles, five tackles for loss, two interceptions and four pass deflections on defense. First team All-State back netted 2,807 total yards and 28 TDs while also snagging five interceptions on defense. Bulldozing back churned out the 12th-most rushing yards among all seniors nationally (2,893) and had 34 TDs. Productive wideout registered 1,568 receiving yards and 28 TDs in earning first team All-State honors. Two-way playmaker compiled 1,702 total yards and 15 TDs in claiming second team All-State honors. He also put up 63 tackles, eight pass deflections and six interceptions on defense. Registered 1,300 total yards and 12 TDs this season. Totaled 1,540 receiving yards and 16 TDs in helping Highland Park capture the 5A D1 state crown. Notched a TD and shined in the Blue-Grey All-American Bowl. Reeled in 79 receptions for 1,089 yards and 15 TDs. Converted quarterback racked up 1,446 receiving yards and averaged 132 yards per game with 22 TDs in collecting first team All-State accolades. 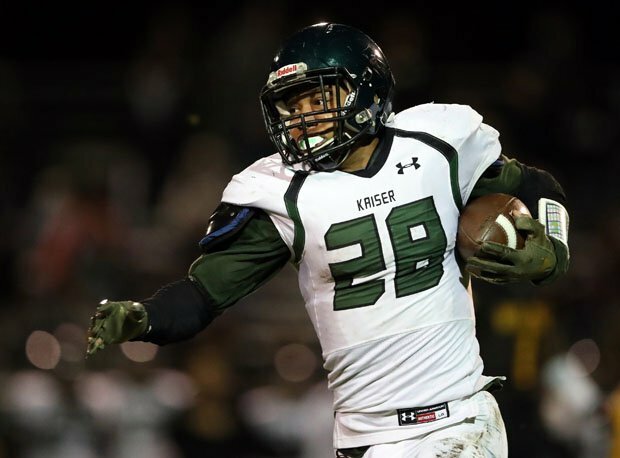 Explosive target recorded the third-most receiving yards among all seniors nationally (1,896) in leading undefeated Longview to a 6A D2 state championship. It was the school's first state title in 81 years. Produced 1,020 total yards and 11 TDs on offense in garnering second team All-State honors. He also logged 43 tackles, seven pass deflections and two interceptions on defense. Registered 1,688 total yards and 17 TDs along with 14 tackles on defense. Game-breaking standout for one of the country's top teams averaged nearly 25 yards per catch and had 10 touchdowns. Put up 525 receiving yards, 4 TDs and more than 15 yards per catch in arguably the toughest league in America. Hauled in 67 catches for 1,323 yards and averaged 132 receiving yards per game with 16 TDs in nabbing second team All-State honors. Recorded the 10th-most receiving yards among all seniors nationally (1,684) with 15 TDs in driving undefeated Dutch Fork to a Class 5A state championship. Two-year starting tackle for one of the country's top programs paved the way to 6.3 yards per carry for the 10-3 Rams. He’s got an offer from Portland State, but those around Churchill thinks he deserves even more attention. He paved the way for an offense that piled up a whopping 524 yards per game. Southwest Minnesota State has offered, but Washington State is beginning to show some interest. Also a basketball player, Fulford helped the Spartans gain 333 yards per game. Considered one of the top five linemen in 1A Indiana football, Ousley recorded 54 pancake blocks over two seasons when Triton piled up a remarkable 7,300 rushing yards. Coach Ron Brown said: "He has excellent footwork, is explosive off the ball, blocks to the whistle, and is surprisingly fast due to his long strides in open space." The Vipers piled up 405 points, a 12-1 record and 370 yards per game thanks largely to the versatile Sanders, who played center and long snapper. Physical specimen paved the way for 2,448 rushing yards and 38 TDs on offense in arguably the toughest league in America. No FBS offers yet for athletic big man, who led Generals to 12-1 record, 592 points and 370 yards per game. Tolliver showed off athleticsm, playing defense and recording a sack and safety. In almost 30 years of coaching, the last 17 as head coach at Lincoln, Phil Ferrigno said he never coached a more complete player than Baker, who led the Mustangs to the school's first 13-0 season and state title. He was voted the San Francisco Player of the Year by the San Francisco Chronicle. At quarterback, he threw for 542 yards and seven scores and rushed for 1,172 yards and 16 scores. In the state title game, he rushed for 155 yards and three scores. On defense, he had 58 tackles, four interceptions and blocked two punts. Broussard participated in the prestigious U.S. Army All-American Bowl and was one of the top two-way players in all of California. 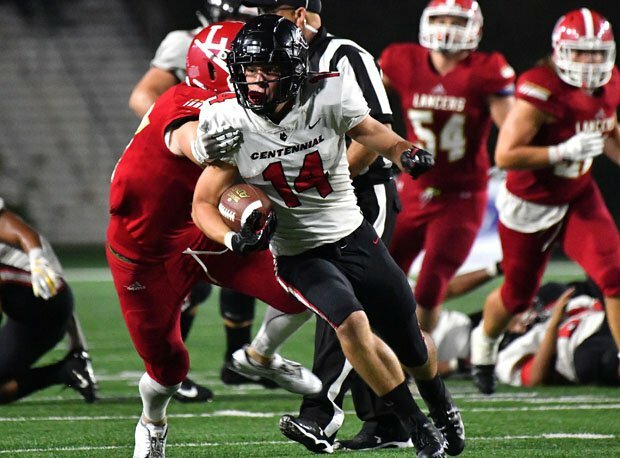 A three-sport standout, Combs had 75 catches for 1,517 yards and 24 touchdowns this season plus contributed 58 tackles and six interceptions from his linebacker spot. He also had three interceptions returned for a TD, one punt return and kickoff return for the 14-1 Tigers. Versatile playmaker recorded 1,382 receiving yards and 18 TDs in guiding Mandarin to a Class 8A state championship. He also had eight interceptions on defense and claimed second team All-State honors. 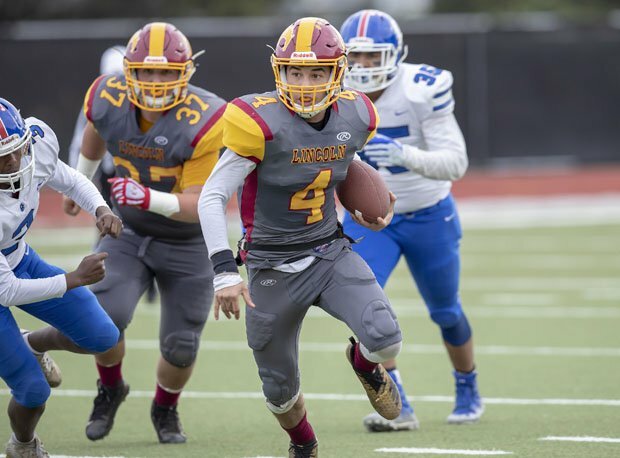 Dynamic talent accumulated 2,012 passing yards, 1,971 rushing yards and had the sixth-most total TDs among all seniors nationally (51) in claiming first team All-State honors. He also notched 100 tackles, seven pass deflections and handled punting duties. His coach Dan Purlee said Hunt-Thompson is the "best player I've had over the last 19 years. Great speed, athleticism, instincts and intelligence. He's got a great frame. There's no doubt he's a D1 talent." He had 73 catches for 1,504 yards and 23 touchdowns at Beatty. He also rushed for 2,180 career yards and 39 touchdowns. On defense, he had 100 tackles and 16 career interceptions, and added a remarkable 11 touchdowns on returns. Elusive playmaker notched the fifth-most rushing yards among all seniors nationally (3,067) and had 37 TDs. He led the Lone Star State in rushing yards in 2018. The do-it-all playmaker attained first team All-State honors. Posted 1,774 total yards and 29 TDs in capturing second team All-State accolades. He also netted 28 tackles, seven interceptions and four INTs for TDs. Todd totaled the second-most rushing yards among all seniors nationally (3,315) and had 46 TDs in spearheading Santee to the Class 7-AA state title game. Two-way force notched 1,134 receiving yards and nine TDs along with 107 tackles and 23 sacks on defense. The disruptive force notched 73 tackles, 12 tackles for loss and nine sacks in helping Folsom capture a state championship. Physical specimen registered 59 tackles, eight tackles for loss and seven sacks. Viral 350-pound running back had three rushing TDs and 23 tackles on defense. Was tied for the second most sacks in America (24). The relentless force recorded 49 tackles, 14 tackles for loss and eight sacks in helping Folsom capture a state championship. The son of NFL Hall of Famer by the same name has lived up to his namesake on the field, ranking second in the nation with 24 sacks. According to his coach Brad Lord, Sapp had 92 tackles, 28 for loss, he bench presses more than 300 pounds, squads more than 500 and runs a 4.6 40-yard dash. "We use him as a DE and our 4-3 defense because he is devastating off the edge," Lord said. "But with his athleticism, he could easily play outside linebacker in a 3-4 defense." A first-team All-State defensive lineman in 2017, he was named first team 2018 Florida Athletic Coaches Association Central Florida team. Beyond everything else, he owns a 3.6 GPA and "is a big time leader in our school," Lord said. "He is a big reason why our team has made it to the regional finals three of the last four seasons." This hidden gem logged 27 tackles, 20 tackles for loss, 11 sacks and 14 QB hurries. Racked up 118 tackles, 40 tackles for loss, 11 sacks and three forced fumbles in earning second team All-State accolades. 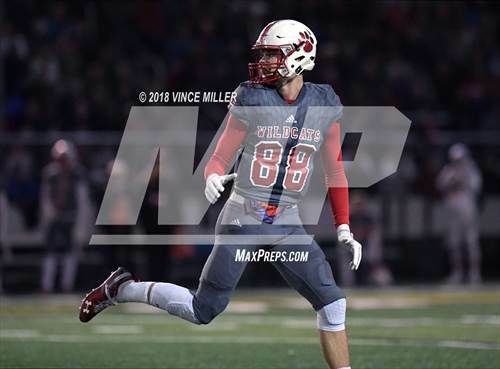 Versatile playmaker totaled 153 tackles, 48 tackles for loss and 19 sacks along with three TDs on offense in claiming second team All-State honors. Netted 65 tackles, 23 tackles for loss and 13 sacks in earning first team All-State accolades. Logged 79 tackles, 23 tackles for loss and 17 sacks in powering Harrisburg to the Class 6A state final. Also earned first team All-State honors. Recorded 107 tackles in charging Centennial to a Class 5A state championship. The towering linebacker produced 113 tackles, 26 tackles for loss, 12 sacks and four forced fumbles. Totaled 121 tackles and nine sacks. Reeled off 79 tackles, 14 tackles for loss, seven sacks and four pass deflections in arguably the toughest league in America. Racked up the third-most rushing yards among all seniors nationally (3,252) and was seventh in scoring with 47 TDs. He also logged 114 tackles and 10 tackles for loss. Second team All-State pick posted 49 tackles, 16 tackles for loss and eight sacks along with seven rushing TDs. Led nation in tackles with 238. Second team All-State selection had 82 tackles, 27 tackles for loss and 12 sacks in driving Bixby to a Class 6A- II state championship. Registered 53 tackles and 11 tackles for loss in helping Whitehaven reach the state final. First team All-State selection registered 88 tackles and 10 pass deflections along with 687 rushing yards and 11 TDs on offense. Named Delaware's defensive Player of the Year. 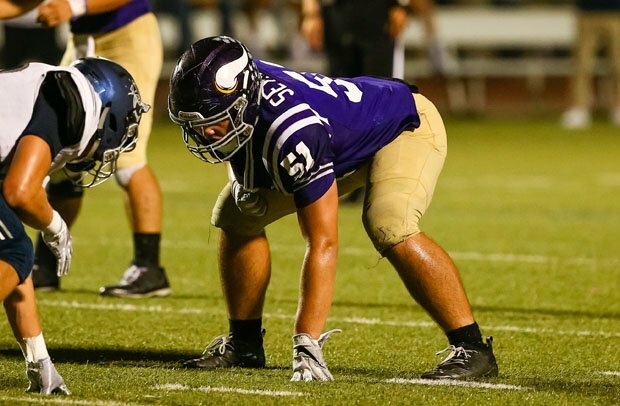 Notched 187 tackles, 43 tackles for loss, 15 sacks and six pass deflections in earning second team All-State honors. First team All-State selection 88 tackles, six tackles for loss and three interceptions. Disruptive force notched 122 tackles, 39 tackles for loss, 13 sacks and four pass deflections. The productive talent had 141 tackles in earning first team All-State honors. First team All State selection posted 743 yards, 11 TDs and nine interceptions on defense. Rangy defensive back shows a lot of promise and posted 23 tackles with seven interceptions. Had 58 tackles and seven pass deflections in earning second team All State honors. He may only be 5-7, but he plays bigger than he is. The scrapper notched 2,126 total yards, 45 TDs along with 51 tackles, 12 pass deflections and four interceptions on defense. Versatile playmaker posted 370 total yards, four TDs along with 36 tackles, 16 pass deflections and four interceptions on defense. Racked up 1,369 passing yards, 652 rushing yards, and 23 TDs in driving Immaculate Conception to a state title. He also had 64 tackles, five pass deflections and two interceptions on defense. The ballhawk safety logged 100 tackles, eight pass deflections and four interceptions in earning first team All State accolades. Second team All State selection had 59 tackles and five interceptions in boosting Broken Arrow to a state crown. Second team All State selection recorded 2,546 passing yards, 755 rushing yards and 36 TDs in driving Union to a state championship. 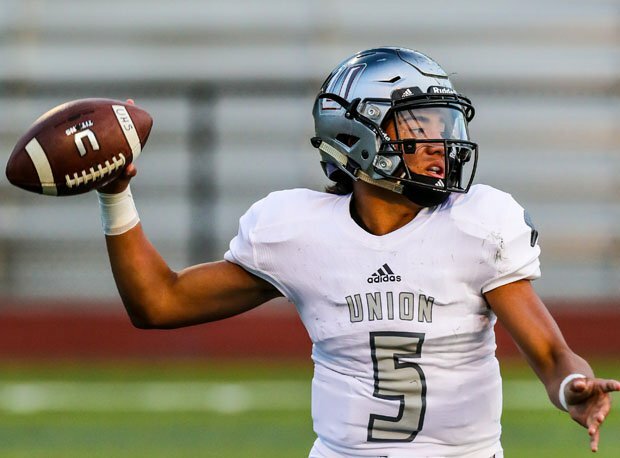 Senior Lincoln Victor played quarterback for Union, but he could be a defensive player in college. MaxPreps National Football Editor Zack Poff and staff writers Lynden Ostrander and Mitch Stephens contributed to this report. Thanks to high school coaches who offered valuable input.